Uneven settlement of a foundation is always caused by some form of shifting of the soil beneath the foundation, but this shifting can take place for several reasons. Soils with weak bearing capacity. 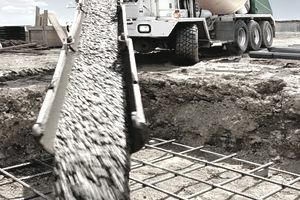 Some soils are weak and highly compressible by nature, and buildings erected on such soils require special footings to spread the load over a wider area. This tends to be an issue about which local building architects are well familiar, and it is generally addressed during the excavation and construction of the foundation. Poorly compacted soil. Building sites for commercial or residential structures often consist of land that has been artificially leveled and filled for ease of construction. When properly compacted, this fill soil can provide a perfectly solid base for supporting foundations, but when not compacted, the soil may settle and compress unevenly under the foundation, leading to structural damage. Changes in soil moisture. Soil that is either too dry or too wet can cause foundation settlement. When moisture builds up, soils saturate and lose their load-bearing capacity. Dry soils shrink in volume. Either situation can cause uneven settling of the foundation. Soil moisture changes can come about due to prolonged drought or by mature trees and other plantings that draw moisture from the soil. In rare instances, leaking in subfloor heating, ventilation, and air-conditioning ductwork can affect the soil moisture beneath the foundation. Trees and vegetation. Large trees, shrubs, and other vegetation planted along a building's foundation or close to it can gradually draw the moisture out of the soil and cause it to shrink. This situation is more common with shallow foundations than with basement-level foundations that extend down many feet. When foundation settlement begins to occur several decades after construction, the soil has likely shrunk because large trees are drying out the soil. Soil consolidation. The weight of a building on the underlying soil, especially fill soils that were added just prior to construction, will naturally compress the soil. Clay soils, in particular, become very dense as moisture is squeezed out. As the soil consolidates and shrinks, the foundation settles downward, a movement that can cause cracks and other structural damage. Vibration. Vibration of the soil from seismic activity or even from nearby road traffic can cause soils to settle or shift unevenly, leading to structural damage to the building. Symptoms of differential settlement may appear fairly soon after a building's construction, or they may take decades to make themselves known. Obvious signs include cracks in the concrete slab or foundation walls supporting the building, or doors and windows that are out of square or hard to open and close. When a foundation settles unevenly, it can begin to skew the wood framing, which can throw door and window frames out of square. You may be able to verify that alignment of window and door frames by checking them with a level. Other signs of differential settlement include breaks in seams between drywall panels, tilting chimneys, bulging walls, and exterior stairs that begin to tilt or sink. Some cracking in foundation walls is normal and expected with the passage of time, but when these cracks are wider at the top and narrow or nonexistent at the bottom, the soil beneath the foundation is likely settling at an uneven rate. You may see signs of vertical movement in the building's foundation, such as changes in the relative position of the foundation in relation to patios or concrete slabs edging the building. In very extreme cases, the floors themselves will be thrown out of level, so much so that a marble or tennis ball will begin to roll when placed on the floor. Although many symptoms of differential settling are easy to recognize, you will need to consult a structural engineer to determine the specific causes and recommended solutions for the problem. Very slow and gradual settlement may not be an urgent problem, while more rapid settlement may require emergency solutions. Some settlement causes merely cosmetic issues, while more severe and rapid settlement may be a major threat to structural integrity and the building's real estate value. Only a structural engineer can properly evaluate the causes of differential settlement of a structure and tell you if solutions are necessary. You need to have the problem diagnosed early, before the symptoms become major. It is generally possible to solve the issues, but addressing them early is the easiest and most affordable approach. And if the settling is the result of professional mistakes made during the foundation's construction, you are more likely to receive compensation if you make your claim early rather than decades after the work is completed. In some cases, the engineer may recommend simply monitoring the settling and addressing superficial cosmetic concerns. Uneven foundation settling—differential settlement—is best prevented by careful analysis of the soil before a building foundation is constructed. The best soils for building foundations are nonexpansive—meaning that they contain little clay or silt content. Ideally, the building site will be native soil rather than a site artificially filled with outside soil. Make sure to consult an engineer to determine the load-bearing capacity of the soil. Any necessary changes or amendments to the soil—or to the foundation construction methods—can be determined early, before the foundation is built. In some cases, the solution may be as simple and extending the foundation below the poor soils to good load-bearing soils.